It’s that time of year, where the strive for summer bodies are in full swing. It’s like New Years Day all over again. If you are one of the 67% of people who never use their gym membership, maybe it’s time to consider cutting ties. Considering that the average gym membership costs $69 per month, you could be looking at a $828 dollars per year savings. For women, especially, the gym can often feel like an intimidating place with too many options. Why not consider downsizing to your own personal home gym? The cost of starting up is no less cost effective than an unused membership! So, don’t let the cost or atmosphere of the gym keep you from your own self care. I will show you how simple it is to start a home gym for less than the cost of a 1 month gym membership. Avoiding working out all together due to the gym membership costs and/or atmosphere shouldn’t stop you from gaining the great benefits! Getting a recommended 30 minutes of exercise per day not only assists in weight loss but also speeds up your metabolism. While there are definitely body benefits, in my opinion, the best ones are the ones that happen in your brain. After exercise, our brains release endorphins that elevate our mood and reduce stress. You will see improvements in sleep, and a reduced amount of stress, depression and mood swings. Once you have created a habit of exercising, your life expectancy actually begins to increase and your body stores less fat as your muscle density increases. I can only imagine that all of these benefits of exercise are behind the studies that show people who workout 3 hours per work actually make more money than those that don’t! This makes perfect sense. If you handle stress better and sleep better, you are more likely to perform your daily tasks better which may lead to higher productivity at work. In order to avoid missing out on the great benefits of daily exercise, get yourself a home gym started! Starting up an inexpensive home gym is as simple as a trip to Amazon! From there, there are tons of free workout videos available on YouTube to help guide you along the way! So, what equipment should you get started with? Kettlebells are a great option for a home gym because they are easy to store and will help you begin weight training exercises. Weight training isn’t always a favorite workout for those who are not big gym goers. While it might take some getting used to, weight training is definitely something you want incorporate into your home workouts. Your muscles build, metabolism speeds up faster and for a longer period of time! You can easily get started with a set of kettlbells for about $40. Having a varied amount of weights will be helpful when doing various different workouts. I about died of sheer joy the day our gym started carrying resistance loops. Honestly, I don’t know why I don’t own my own yet! They are so inexpensive and you can do so much with them! Resistance bands are great if you don’t have a lot of time to put into a workout because you can easily incorporate them into your downtime. Watching TV, cooking dinner or even brushing your teeth at night. While they can be used in simple, mindless workouts, they can also be used to seriously whoop your muscles into shape. Getting a kit for your home gym will give you different amounts of resistance so you can work your way up or even double up! Don’t be intimidated by the exercise ball. Chances are you have seen this used a variety of ways and you probably think there is no way you can do any of them. The best part is, these are great for a home gym because they can be used for beginners all the way to “professional” fitness levels. These do take up a bit more space when it comes to accommodating your home gym. However, if you also have a home office, these are perfect in place of a chair! They help with posture and concentration when you’re behind a computer screen all day. More and more professionals and even some schools are starting to allow exercise balls as replacements for desk chairs. There you have it! Some easy to purchase, inexpensive equipment for your very own home gym! 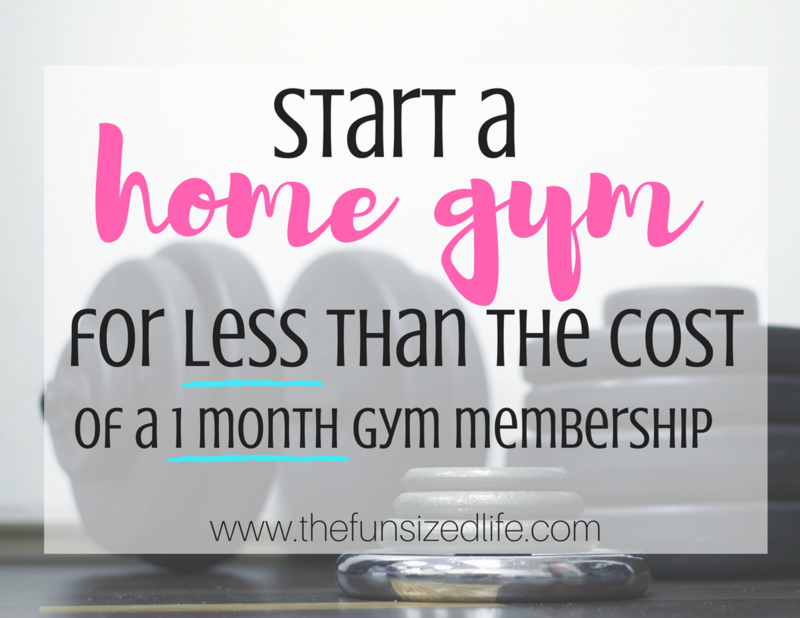 It is so simple to get started with an easy to use home gym for the same cost as you would pay for a gym membership for one month! Now, you may be thinking, “What about the treadmills?” The truth is, you are going to see bigger changes by choosing workouts that incorporate kettlebells than you will on the treadmill. That should be great news since most people don’t exactly enjoy running. As long as you are breaking a sweat for 30 minutes, you are on the right track. You are burning calories and building muscle. It can really be as simple as that! If you are someone who loves going for a run, then good news, running is a part of our next category! Running – Take yourself for a walk/jog/run around the block a few times! Jumping jacks – These bad boys burn a calorie per jump on average. Sometimes I do them while waiting for food to head up in the microwave! Mountain climbers – Sure these are no one’s favorite. But, incorporate them in between kettle bell reps and you have a great workout set! Chair jumps – Pull out a chair from your kitchen table. Now jump up onto it hyper-active toddler style. Try and do that 10 times. You will get a workout! Yoga – My personal favorite is Yoga With Adriene. She has workouts of all time lengths and all fitness levels! Once you have your home gym in place, before you go too crazy or start purchasing more equipment just work on creating a habit of working out. Start small if that’s easier. Plan on taking 30 minutes 3 times per week to get the hang of your new equipment. Rushing into something too fast is a great way to fail fast. Our brains can literally only focus on new tasks for a limited amount of time. If you push yourself too hard right away, you might be more likely to reach for unhealthier foods after! There is nothing wrong with taking it slow. Once you have created a 3 day habit, aim for 4 days or extend your workout by 10 minutes! Whatever works for you and your home gym schedule! You have nothing to lose, since you’re already saving over $700 by skipping your membership fees and creating your own workout at home.